(38 mins) In this episode, host Becca Lory, CAS, BCCS is joined by guest host Dena Gassner. As you may recall, Dena is an advocate, writer, and speaker- including presenting for the UN in Geneva, Russia, and Cambridge. Becca and Dena welcome guest Sharon daVanport. Sharon is the Founding Executive Director of Autistic Women & Nonbinary Network (AWN Network) ~ formerly known as Autism Women’s Network. Sharon’s speaking invitations include the United Nations Headquarters on World Autism Awareness Day (Empowering Autistic Women & Girls) and The White House, Obama Administration (advising on topics regarding disability and autism.) In her work as a Disability & Autistic Rights Activist, she has consulted as an expert panelist advising government agencies, including the GAO, and various policy forums. Sharon speaks at national and local conferences and hosts workshops on topics including: health and wellness for women with disabilities, violence against women and girls in vulnerable communities, and how to effectively use privilege when amplifying the voices and work of disabled people who experience racial and gender inequality. Honors include: ASAN’s Self-Advocate of the Year Award for service to the self-advocacy movement, LSS Award for advocacy focusing on autistic women and girls, and Autism Society of America’s Outstanding Literary Award for editing, “What Every Autistic Girl Wishes her Parents Knew”. In her spare time she enjoys traveling, research, reading, music, and spending time with family and close friends. The three discuss how the AWN Network came to be, why “Nonbinary” was added to their name, and the importance of inclusive advocacy. 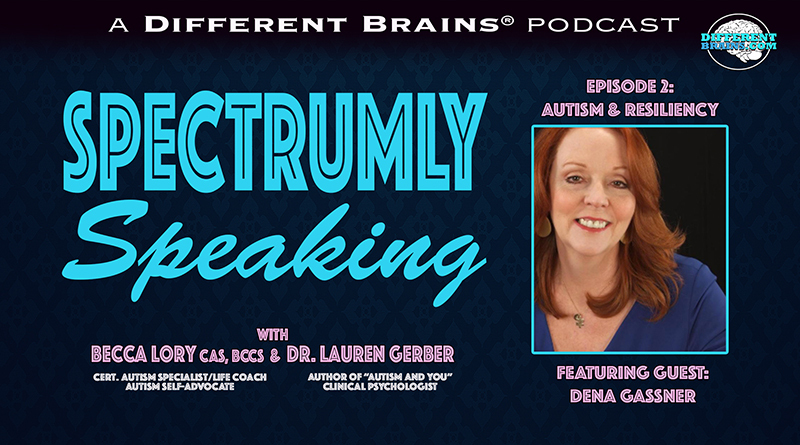 Spectrumly Speaking is the podcast dedicated to women on the autism spectrum, produced by Different Brains®. 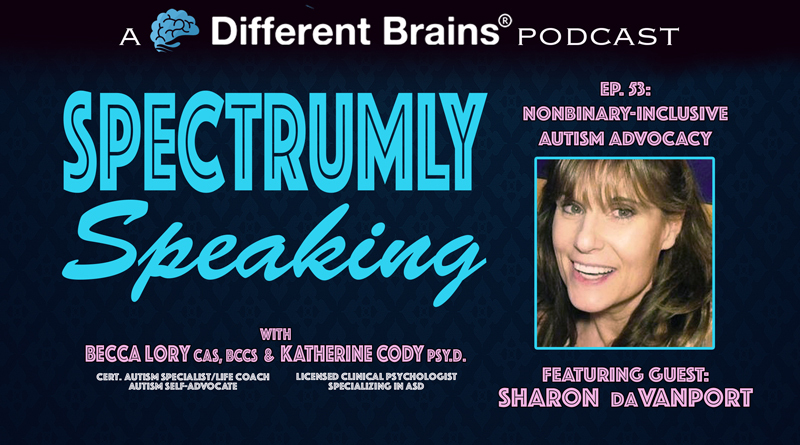 Every two weeks join our hosts Becca Lory, CAS, BCCS (a Life Coach, Certified Autism Specialist, and Autism advocate that is herself on the spectrum) and Katherine Cody, Psy.D. (a licensed clinical psychologist specializing in people on the autism spectrum) as they discuss topics and news stories, share personal stories, and interview some of the most fascinating voices from the autism community. For more about Becca, check out her website, beccalory.com, and look for her on Facebook. Spectrumly Speaking is the podcast dedicated to women on the autism spectrum, produced by Different Brains®. 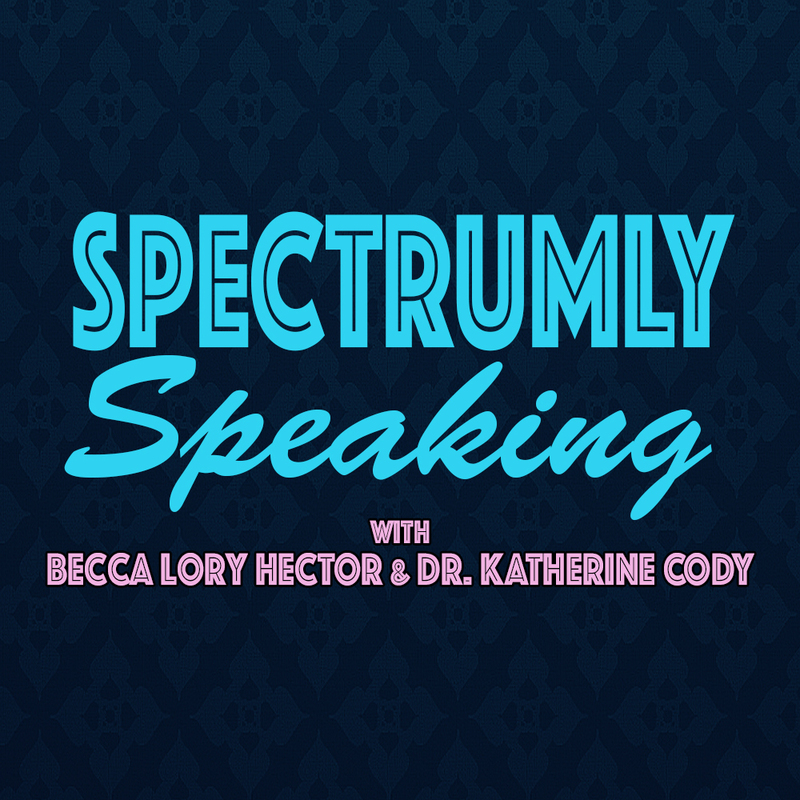 Every two weeks join our hosts Becca Lory Hector, CAS, BCCS (a Life Coach, Certified Autism Specialist, and Autism advocate that is herself on the spectrum) and Katherine Cody, Psy.D. (a licensed clinical psychologist specializing in people on the autism spectrum) as they discuss news articles, share personal stories, and interview some of the most fascinating voices from the autism community. 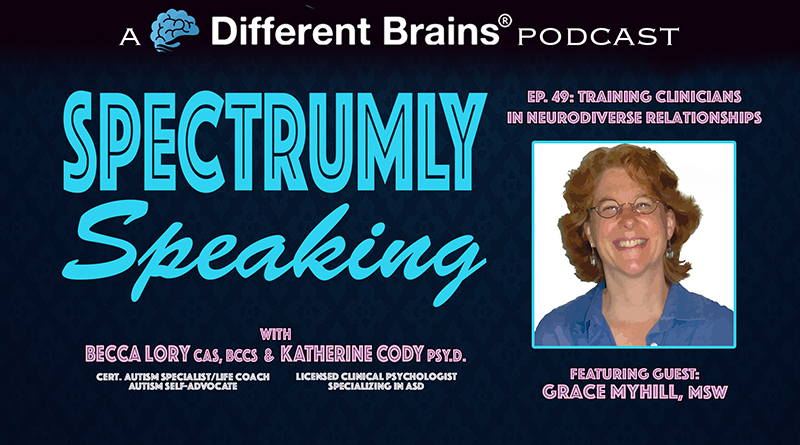 (31 mins) Dr. Katherine Cody and Becca Lory welcome back guest Grace Myhill, MSW to discuss the importance of practitioner training in neurodiverse relationships. (32 mins) In this episode, hosts Katherine Cody, Psy.D. 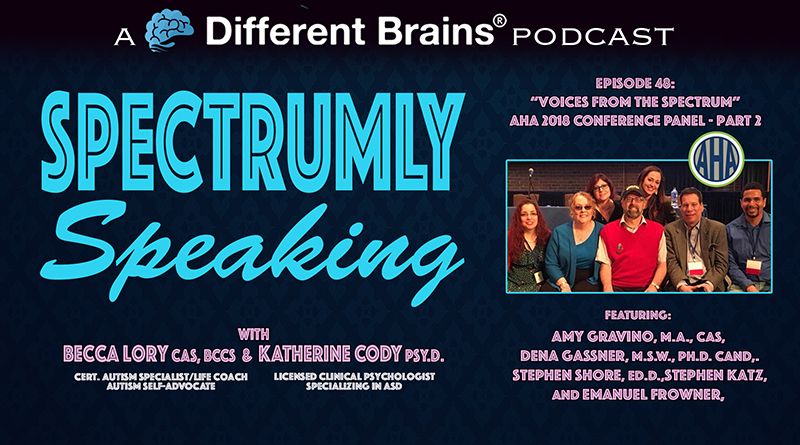 and Becca Lory, CAS, BCCS present part 2 of the "Voices from the Spectrum” panel presented at the Asperger Syndrome & High Functioning Autism Association (AHA) 2018 Conference, and covering practical strategies for people with autism. (33 mins) In this episode, hosts Lauren Gerber Ms. Ed., PSY. D. and Becca Lory, CAS, BCCS speak with Dena Gassner, an advocate, writer, and speaker- including presenting for the UN in Geneva, Russia, and Cambridge.